1959 Top 20 Hits. 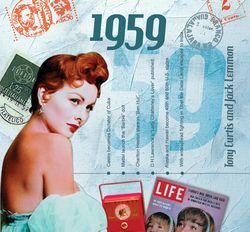 For an extraordinary gift which will transform a birthday or anniversary into a toe-tapping event, get our CD with the music of 1959! Twenty hits in all! Includes: 20 Hits Of 1959 - The Classic Years 1. Neil Sedaka - Oh! Carol. 2. Louis Armstrong - Mack The Knife. 3. The Isley Brothers - Shout!. 4. Perez Prado - Mambo No.5. 5. Elvis Presley - One Night. 6. Guy Mitchell - Heartaches By The Number. 7. Santo & Johnny - Sleepwalk. 8. Charles Mingus - Goodbye Pork Pie Hat. 9. Harry Belafonte - Cotton Fields. 10. Johnny Horton - The Battle Of New Orleans. 11. Johnny Mathis - Someone. 12. Duke Ellington - Satin Doll. 13. Hank Snow - My Nova Scotia Home. 14. The Browns - The Three Bells. 15. Perry Como - I Know. 16. Dave Brubeck - Jump For Joy. 17. Frankie Lane - Rawhide. 18. Johnnie Ray - I'll Never Fall In Love Again. 19. Ray Peterson - The Wonder Of You. 20. Tony Bennett - September Song. See our other 60th birthday ideas.